WASHINGTON – The new American commander in Afghanistan has been given carte blanche to handpick a dream team of subordinates, including many Special Operations veterans, as he moves to carry out an ambitious new strategy that envisions stepped-up attacks on Taliban fighters and narcotics networks. 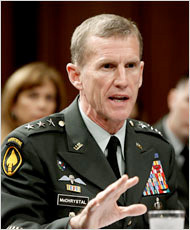 Gen. Stanley A. McChrystal, the new American commander in Afghanistan. The extraordinary leeway granted the commander, Gen. Stanley A. McChrystal, underscores a view within the administration that the war in Afghanistan has for too long been given low priority and needs to be the focus of a sustained, high-level effort. General McChrystal is assembling a corps of 400 officers and soldiers who will rotate between the United States and Afghanistan for a minimum of three years. That kind of commitment to one theater of combat is unknown in the military today outside Special Operations, but reflects an approach being imported by General McChrystal, who spent five years in charge of secret commando teams in Iraq and Afghanistan. With his promotion approved by the Senate late on Wednesday, General McChrystal and senior members of his command team were scheduled to fly from Washington within hours of the vote, stopping in two European capitals to confer with allies before landing in Kabul, the Afghan capital. General McChrystal’s confirmation came only after the Senate majority leader, Harry Reid of Nevada, went to the floor to make an impassioned plea for Republicans to allow the action to proceed, fearing that political infighting would delay approval of the appointment. He told of a phone call on Wednesday from Adm. Mike Mullen, the chairman of the Joint Chiefs of Staff. Mr. Reid said that Admiral Mullen had told him that there was a sense of urgency that General McChrystal be able to go to Afghanistan that very night. He said that according to Admiral Mullen, “McChrystal is literally waiting by an airplane” to go to Afghanistan as the new commander. Almost a dozen senior military officers provided details about General McChrystal’s plans in interviews after his nomination. The officers insisted on anonymity because of the sensitivity of the effort, and insisted that their comments not be used until the Senate vote, so as not to preempt lawmakers. For the first time, the American commander in Afghanistan will have a three-star deputy. Picked for the job of running day-to-day combat operations was Lt. Gen. David M. Rodriguez, who has commanded troops in both Iraq and Afghanistan. Generals McChrystal and Rodriguez have been colleagues and friends for more than 30 years, beginning when both were Ranger company commanders as young captains. General McChrystal also has picked the senior intelligence adviser to the Joint Chiefs of Staff, Maj. Gen. Michael T. Flynn, to join him in Kabul as director of intelligence there. In Washington, Brig. Gen. Scott Miller, a longtime Special Operations officer now assigned to the Joint Chiefs of Staff but who had served previously under General McChrystal, is now organizing a new Pakistan-Afghanistan Coordination Cell. Just how this new team will grapple with the increasingly violent Taliban militancy in Afghanistan is unclear, although General McChrystal has said he will focus on classic counterinsurgency techniques, in particular protecting the population. Defense Secretary Robert M. Gates has asked General McChrystal to report back within 60 days of taking command with an assessment of the mission and plans for carrying out President Obama’s new strategy. 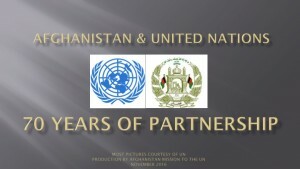 “Success will be difficult to define but will come in reduction in I.E.D.’s, reduction in poppy, more interdiction of Taliban crossing the border, some anticorruption arrests/exiles, and greater civilian effort possible as a result of a reduction in the threat,” said Maj. Gen. Peter Gilchrist, a retired British officer and a former deputy commander of allied forces in Afghanistan who praised General McChrystal’s appointment. At the Pentagon, under General McChrystal’s direction, a large area of the Defense Department’s underground, round-the-clock emergency operations facility – called the National Military Command Center – has already been shifted to the Afghan war effort. The makeover in the American military command is not the only major set of personnel changes in Afghanistan. The Obama administration has surrounded the new United States ambassador to Kabul, Karl W. Eikenberry, a recently retired three-star Army general, with three former ambassadors to bolster diplomatic efforts in the country. Francis J. Ricciardone Jr., a former ambassador to Egypt and the Philippines, has been tapped as General Eikenberry’s deputy. Earl Anthony Wayne, a former ambassador to Argentina, is heading up economic development initiatives in the embassy. Joseph A. Mussomeli, the former ambassador to Cambodia, will be an assistant ambassador in Kabul. As director of intelligence on the Joint Staff, General Flynn holds a position, called the J-2, that has often been a springboard to a senior executive position across the alphabet soup of American intelligence agencies. But General Flynn, who was General McChrystal’s intelligence boss at the Joint Special Operations Command, has chosen to return to the combat zone. 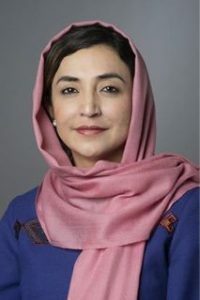 In a sign of the importance being given to explaining the new strategy to Afghans, across the region and the world, General McChrystal will also be taking the first flag officer to serve as chief of public affairs and communications for the military in Afghanistan. Rear Adm. Gregory J. Smith, who has served as director of communications and spokesman in Iraq during the troop increase under Gen. David H. Petraeus, had been scheduled to retire this summer. But officials said he received a personal request from Adm. Mike Mullen, chairman of the Joint Chiefs of Staff, to serve in the same capacity for General McChrystal. David M. Herszenhorn contributed reporting from New York, and Richard A. Oppel Jr. from Austin, Tex.